The multifunctional serine protease thrombin is a crucial player in coagulation, inflammation and cellular proliferation events. The enzyme represents an important therapeutic target due to its functions such as the conversion of fibrinogen to fibrin and concomitant platelet aggregation. 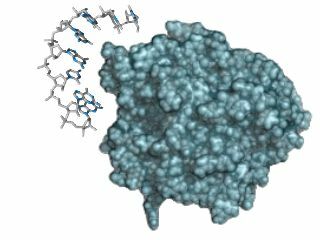 Besides small compounds and antibodies, also aptamers were generated to inhibit thrombin activity. The interactions of the two thrombin aptamers HD1 and HD22 with thrombin are characterized in this example study using our sophisticated MicroScale Thermophoresis (MST) platform. The upper graph shows the interaction of thrombin with the aptamer HD22 under different buffer conditions (SELEX buffer and serum). The data implies a reduction in the binding affinity of the aptamer when measured in serum. In contrast, the interaction of thrombin to the aptamer HD1 (middle graph) does not show a large difference in the binding affinity in serum vs. buffer. Despite the higher affinity of HD22 aptamer to thrombin in SELEX buffer, both aptamers (HD1 and HD22) show comparable affinity to thrombin in serum when comparing their binding affinity (bottom graph). The results demonstrate that our MicroScale Thermophoresis assays are perfectly suited to study aptamer- target interactions.